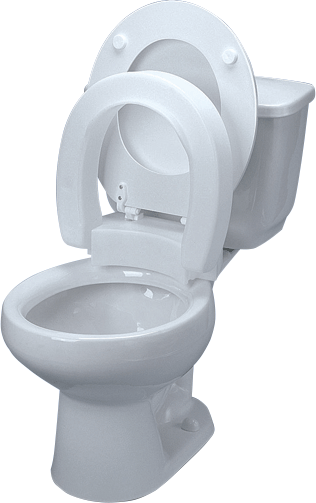 Offers all the comfort and convenience of our acclaimed Tall-ette Elevated Toilet Seats, but with a hinged benefit. This model features a seat riser made of two parts which are hinged together, allowing the ring to be lifted in the same manner as your standard toilet sea. The seat is installed using a standard toilet seat and cover and does not appreciably change the appearance of the toilet. It elevates the seating position by 3" for easy sitting and rising. The hinged feature makes cleaning as easy as 1-2-3. McKesson Raised Toilet Seat with Arms 5"